These flowers have no raw fabric edges, so they're perfect for embellishing just about anything. When you print the pattern, you'll need to piece it together. 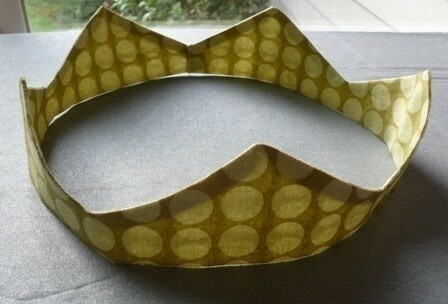 It ends up 25 1/2" long and 4 1/2" wide with five points. 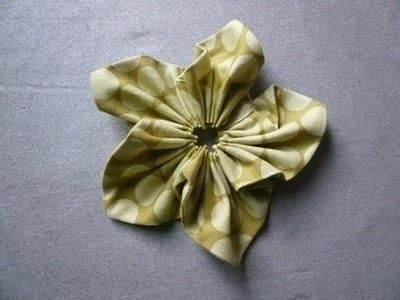 Fold fabric in half and cut flower with the long, flat edge on the fold. Refold with right sides together and stitch 1/4" from the zigzagish edge. Leave both ends open. Trim and clip corners. Turn right side out through one end. Carefully push points out with something pointy. Press with a steam iron. Turn one end to the inside 1/4" and press. Feed the other end inside the pressed end so it creates a loop as shown. Stitch near the fold to hold the two ends together. Hand stitch a long row of stitching near the straight edge. Pull the thread to gather the center of the flower together and knot. Stitch a button over the center onto whatever you're embellishing. 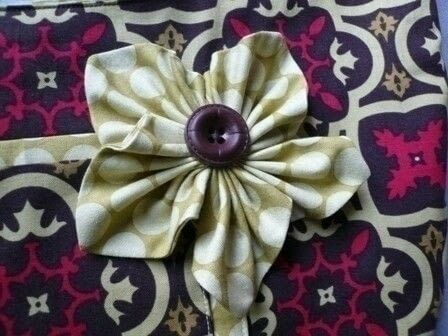 Be sure to catch some of the center of the flower in the stitches. Love this! 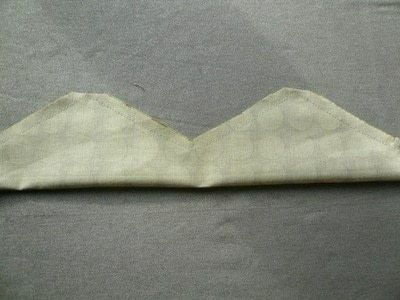 Such nice, neat edges without having to sew a lot of individual petals.